Indicator Parabolic SAR is probably one of the most easy to use and beloved by many traders from all the trend indicators. Why is it so? First, it is very easy to understand and second, it is incredibly easy to use. Today the Olymp Trade analysts will tell you how to use this wonderful indicator. We really like to compare the Parabolic SAR system with a lasso. Let’s imagine that we have become American cowboys and are trying to lasso a horse. When we throw a lasso around the neck of a horse, it cannot escape from us. The loop will tighten with each movement of the horse until the horse stops. Now, the horse has stopped and run the other way and we are getting ready to lasso it again. A trend on the market is a “horse,” and our “lasso” is the parabolic (Parabolic SAR) system. With each new movement of the trend, Parabolic will come closer and closer to its new signal. When there is a signal from Parabolic to reverse, this means that a new trend has started. The parabolic system was invented by J. Welles Wilder Jr. at the end of the 70s. In fact, the system is based on moving averages indicator which Olymp Trade analysts have already told you about. Just as the lasso loop tightens, when the price reaches a new minimum, the moving averages of the parabolic system gradually become shorter. The calculation of the stop and reversal price starts again for each new price signal. That is why SAR stands for stop and reverse. 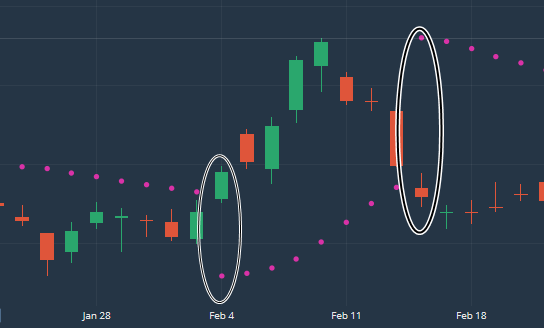 As you can see on the chart, the system consists of a sequence of points that are built above or below each Japanese candlesticks or bar (depending on the trend). If the trend is bullish, the points are located under the chart. If the trend is bearish, the location of the points is above the chart. Points “behavior” is sometimes graphically very similar to parabolic motion. Thus, the system is called a parabolic system. The Olymp Trade clients like this indicator for perfectly understandable signals that are obtained when the price breaks through the stop and reversal level, that is at the time when points change their position (for example, they were under the chart and now are above the chart, and vice versa). Thus, there is a very clear signal for a trend reversal at the moment when a new point appears. 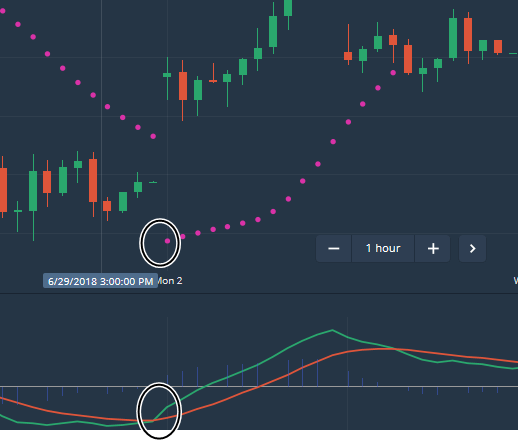 The general rule when to use the Parabolic SAR system is the following: If there are some system points under the chart, the trader should buy the asset; and if the Parabolic points are starting to appear above the chart, then the trader needs to sell the asset. Unfortunately, the use of only one such signal is often not very effective. What to do in this case? When does the Parabolic not work and with what can it be combined? As we said earlier, it is a trend indicator, i.e., you can only “lasso” a running horse with the Parabolic system. If the horse is standing (there is no trend), then, alas, the system probably will not work. So we can come to the first conclusion: IT IS NOT ADVISABLE TO USE THE PARABOLIC SYSTEM WHEN THERE IS NO TREND. The second problem with the system is that it is almost impossible to use it separately from the other indicators. One of the most effective methods of using the Parabolic system is its combination with the MACD indicator (see the strategy on the Olymptrade website “MACD Professional”). The combination of Parabolic SAR with other indicators allows to achieve greater efficiency of its use. Use the parabolic system (Parabolic SAR) and achieve excellent results in trading! Parabola adalah petunjuk carta pertama yang sangat berguna untuk saya. Ia sangat berkesan dalam kombinasi dengan MACD. MACD sering meramalkan trend masa depan, nampaknya berjalan di hadapan, dan jika SAR menegaskan isyarat ini, perintah itu biasanya menguntungkan.